"You won't believe how quickly this pan pizza goes together!" Cut each biscuit into 8 pieces; toss with pizza sauce and 1 cup of the cheese. Spread in sprayed 13x9-inch (3-quart) glass baking dish. 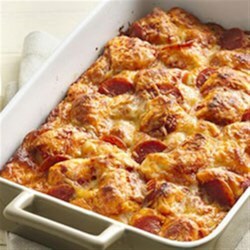 Top with pepperoni and remaining 1 cup cheese. Bake at 375 degrees F 20 minutes or until golden brown and bubbly. Handheld pizza on the go! This is tasty! Added some mushrooms and olives and a few extra pepperonis. Yummy! this was great. I had 1/2 jar of salsa instead of pizza sauce. My daughter and I loved it.